Some people might say that BBQ is a religion to me. So it should come as no surprise that I would be spending a Sunday lunch in a Q-raunt. Add to this that I had a $20 coupon that my wife had purchased for $5 and you'll know that I was pretty close to BBQ heaven. This was actually my 3rd trip to Smokeys BBQ & Diner since the new owners moved into the old Chisolm's BBQ location at NW 23rd & Portland. I had visited the previous location, and owners, once and I'll just say that the food was... well.... meh, at best. Not to give away to much but the new owners are getting it right. 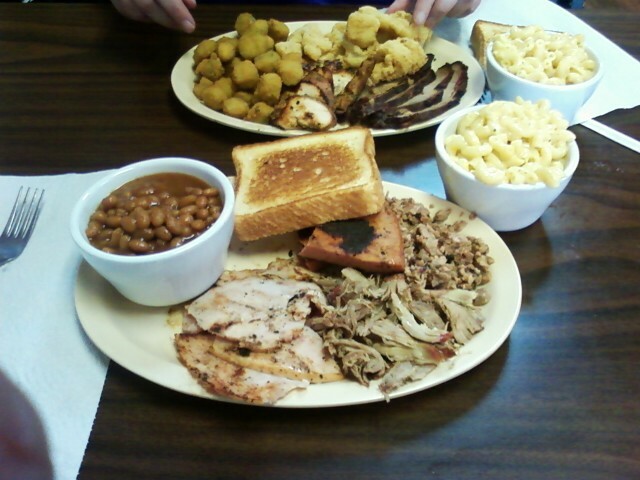 Smokey's goes one better than most Q-raunts that stop at the 3 Meat combo. They have the BBQ Sampler which is a 4 Meat combo! I chose pulled pork, chopped brisket, turkey, and bologna. For my two sides I chose mac & cheese and beans. I know... I forgot to get ribs but I have had Smokey's ribs before and let me just say. They were good both times. So you can't go wrong with them. My wife chose the 3 Meat and picked sliced brisket, boneless/skinless chicken breast, and catfish with okra and mac & cheese for sides. I started off with chopped brisket. It was moist and full of flavor. Had a little bit of fat in it, which I like, and was the perfect temperature. From there I moved to the pulled pork. As of the time I am writing this. Smokey's is the only place in the OKC area I know of that actually pull the pork rather than smash, bash, fold, spindle, and mutilate it and that's how I prefer my pulled pork...... And now as I finish writing all that. I remember that Dale's pulls their pork also. 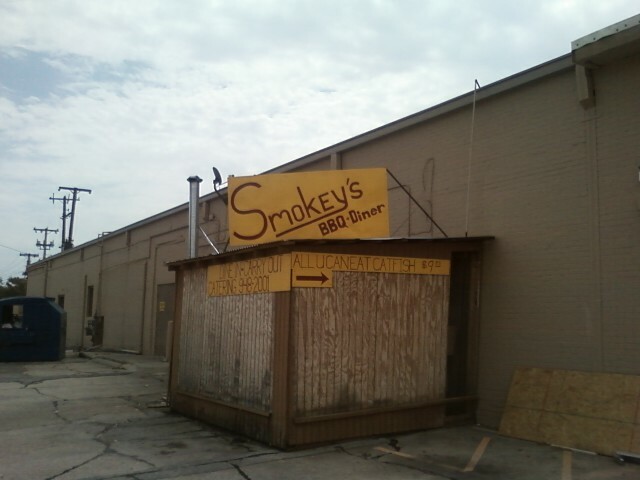 So Smokey's is almost the only place I know of. The pulled pork is moist and has nice color. It could use just a touch more flavor in my opinion but I still think it's the best pulled pork I can get short of taking the 16 hours it takes to make it myself. If they are injecting their butts with anything it is a really subtle injection. I added some of their Carolina style sauce to one bite and the sauce complements the meat well. And that's a good thing since that is BBQ sauces job is to complement the meat. The smoked turkey was about as good as smoked turkey can get. It was moist and had lots of flavor. As I've said before. I'm a smoked bologna junkie. Smokey's takes their bologna one step further. I couldn't see into their kitchen area but it appears they give it a few minutes on a flat top before serving it. So the bologna comes out with some nice carmelization on it that enhances the flavor of it even more. I added some of their hot BBQ sauce to one piece of my bologna and slapped it on my texas toast and made a sandwich. It made my tongue do cartwheels. That's a good thing isn't it? Smokey's mac & cheese is what mac & cheese should be. The pasta isn't overcooked. It has a creaminess to it and just a hint of onion flavor to it. Get the mac & cheese. If you're disappointed with it you might want to have your tongue checked. I'm pretty sure it's defective. The beans aren't really anything special. Which is odd considering these guys are culinary graduates. Beans are one of those things you can really do some amazing things with. These are just beans. No meat added, no apparent modifications to them. I add some of the Carolina sauce to them and it kicks them up a bit but you might want to go with another side. My wife's sliced brisket was pretty good. Had nice color and was lean flat. There was a very thin sliver of fat left from the cap side but I like a little fat left on my brisket. The wife trimmed it off because she doesn't like any fat. Her boneless/skinless chicken was not to bad. I give kudos to any Q-raunt that even attempts boneless/skinless breasts. It has to be one of the most difficult piece of meat to get right. I have almost perfected them in the BBQEA test kitchen but I wouldn't want to try and get them right day in and day out. 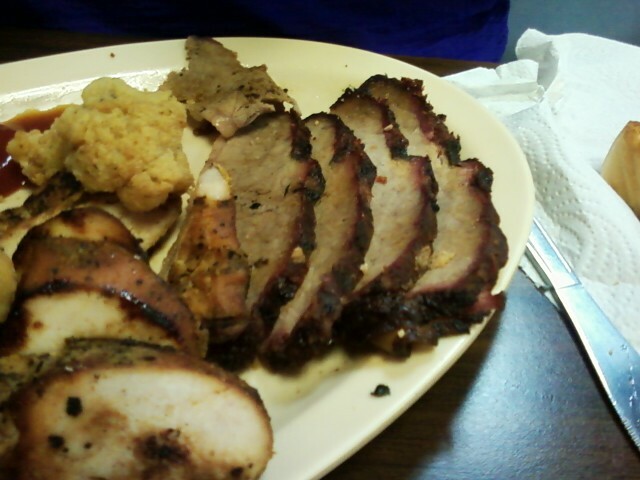 Smokey's had really good flavor and was for the most part moist. There were a few bites that were a little on the dry side but all things considered they pulled the chicken off pretty good. Now my wife is a catfish junkie like I am with bologna. She was disappointed with the catfish. She thought it needed to be cooked just a bit longer. Her Okra appeared to be the same style of frozen okra served in about 99% of Q-raunts that serve okra. She loved the mac & cheese and said she would go back just for the mac & cheese and pie. Wait.... Did I say pie? 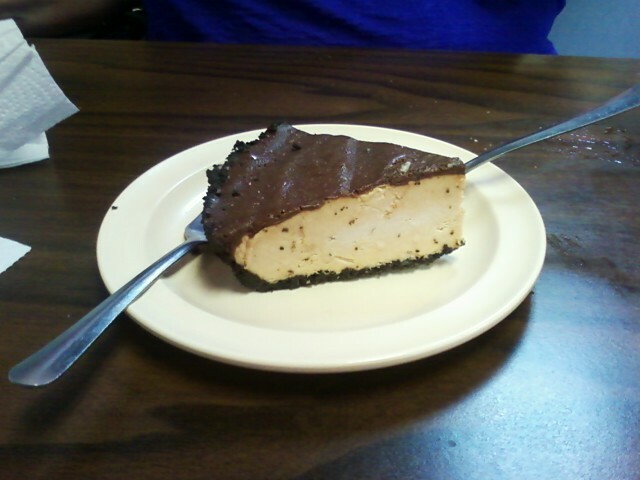 Yep, we had an incredible piece of peanut butter pie. If they have it you should get it. You won't be disappointed if you do but you for sure will be if you don't. It was a really good piece of pie. I personally think Smokeys BBQ & Diner is turning out some of the best Q in the OKC area right now. They also serve non-BBQ food items such as chicken fried steak and burgers. So if you have a spouse that doesn't like BBQ ...**GASP**... They have other options. Smokey's has three sauce options. Mild, hot, and Carolina. The mild is a sweet tomato based sauce and the hot tastes like the mild with some spices add to it. I think they may have changed their Carolina sauce because the first time I tried it I thought I tasted some chili powder in it. I didn't taste that today. All of their sauces are available for sale as well. If you can get them away from Dean Martin who is keeping a watchful eye on them. I'm not going to lie. 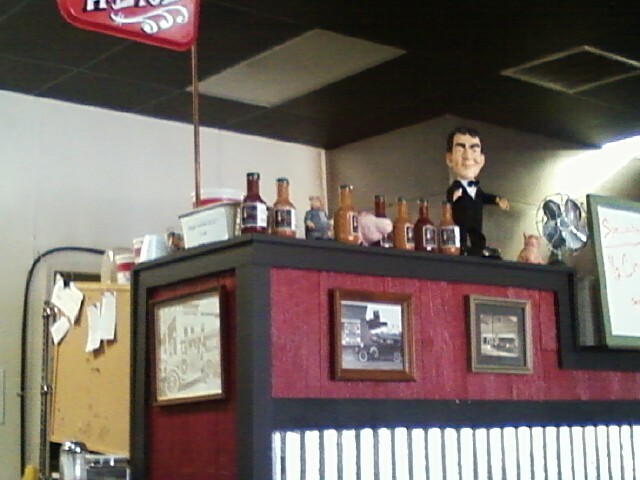 I'm a fan of Smokeys BBQ. I hope you will be too! This place is not good. At the expense of being rude, I'll just say that I disagree. Food is dry, sides are boring. My girlfriend had a burger she liked and I had ribs that I did not like. Save your money on the coupons and go to the east side for your BBQ fix. Yes, seriously. It would appear you formed your opinion based on one visit and one meat. That's not much information to condemn a place to not being good. I have eaten there three times and have tried all of their meats. All three times for me have been consistently good, in my opinion, and I have no agenda or need to lie about any Q-raunt being good. I do all of this anonymously. I don't even let people see me snapping the pictures. So there is no bias towards me when I'm served. I get the same as any other customer. I understand the difficulties that go along with holding meat in Q-Raunts. No matter how good a place is. If you happen to eat there at an off time. You may get meat that has been held for a few hours. I have been to Smokey's twice during the week between 11:30 & 12:30 and once on a Sunday right as they opened. So while they may have been consistent all three times I have been there. I realize they may not be consistent all the time. Unfortunately for you. It may have been the one time you were there. I highly disagree with your opinion. I think OKBBQEA had it right. You must of gone there on a not so great day. While I do like their ribs I will say that it's not the best thing on their menu. I eat here all the time and I noticed on rare days the ribs just didn't turn out well at all but that hasn't happened to me in quite a while. I would highly encourage you to go back and try something different. I think you'll be impressed. I'm not exactly sure what you mean by the sides being boring. The onion rings are amazing and the potatoes are melt in your mouth. It's not Q but you'll be hard pressed to find a better Chicken Fried Steak anywhere! They could spruce up the beans though. Maybe add some smoked bacon in there or something. I hope you read this and give it another shot. "You could take my thoughts on BBQ as the gospel but you would probably be making a mistake. You may notice there are no stars or ratings here. There is a reason for that. I don't like being told how food should be eaten, how it should be made, or even how it should taste and I'm not here to tell you those things. I'm here to tell you how food tastes to me. I know what I like about BBQ but the great thing about BBQ is that there are many styles and tastes out there. Enough to suit just about every one. I do what I do anonymously. I'm not looking for fame, fortune, or free meals. Just good BBQ. So I hope you enjoy my take on the subject but don't take it to heart. Get out there and try it for yourself!"